PowerPoint has some great animation features. They’re simple and easy to use. I covered animation tips in a previous post, but want to focus a little on motion paths in today’s post. Using the motion path feature is straightforward. However, it can be challenging when you want to add to a motion path. For example, it’s hard to discern where the object is at the end of the animation. So you end up doing a bunch of manual tweaks which can be a bit frustrating. Today, I’d like to introduce you to a simple PowerPoint add-in that makes working with motion path’s a cinch. Before we get started, let’s look at how motion paths work for those unfamiliar, and then we’ll look at the add-in. The motion paths are found in the animation section of PowerPoint. There are a few pre-determined paths and then you have the ability create your own custom path. Once you add a motion path, it’s like any other animation. You can easily change the settings in the animation pane. There you can determine when the animation is triggered, how fast you want it, and the timing. The motion path start and stop points are always centered on the object. You can click and drag the motion path to where you want. You can also click and drag the start and stop points. The object’s motion starts at the beginning of the motion path regardless of where the object is on the screen. 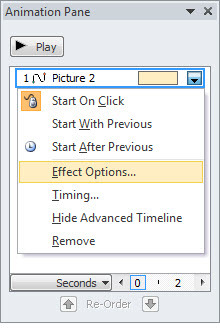 Right click on the motion path to edit its points. Here’s a quick tutorial that shows how to create and edit motion paths in PowerPoint. Working with motion paths can be a challenge because it’s not always easy to align the stop point of one to the start point of another. For example, let’s say on slide one, you want an image to move from one side of the screen to the other. Then on slide two, you want to start with the image in the new position. Figuring out what that position is can be a hassle. Or at least it used to be. Add a duplicate object at the end of the animation. The add-in will duplicate your object at the end point. You can copy and paste that onto the next slide and the object will be aligned to the end point of the animation on the previous slide. 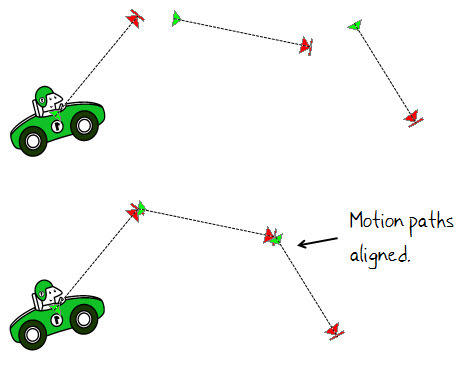 Align motion paths. You can quickly connect the start and end points of your motion paths for one smooth animation. 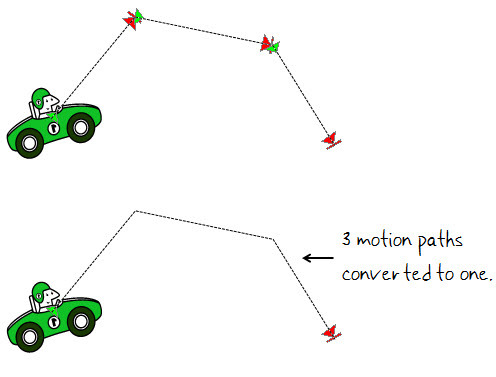 Convert multiple motion paths to a single path. Let’s say you create an object using three different motion paths. But you want them play in sequence. You don’t really need three paths. Instead combine them to a single path and you’re all set. Here’s a quick tutorial that shows how to install and use the motion path add-in. Note: When you install the add-in, you may get a macro security warning, just click ok to install it. I think you’ll find that this motion path tool really comes in handy when building your rapid elearning courses. It definitely takes a lot of the trial and error out of aligning your animated objects. Be sure to thank Shyam for his generous contribution to the PowerPoint community. 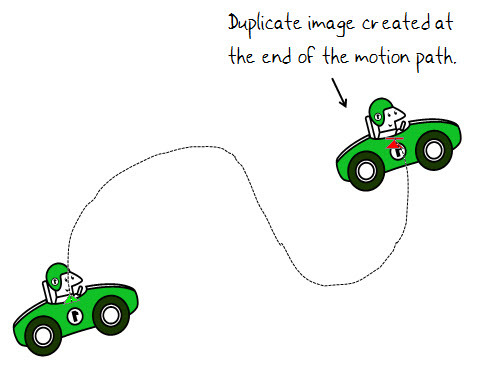 How do you use motion paths in your PowerPoint files? Feel free to share your thoughts via the comments link. You manage to surprize me every time! It’s like my birthday and Christmas presents rolled into one! Can’t wait to start using this awesome add-in. Thank you Shyam!!! A really neat tip – thanks so much. Time to have a play. Tuesdays with Tom—-sounds like a new book title. Thanks for the gift of information and please express my thanks to Shyam as well. The links in the email do not work. Everytime I try to go to download the tool I get website not found. Any ideas? @Wes and Rita: The link is correct. The email just went out, so there’s a good chance that the server is overloaded. When I just clicked it didn’t load, but when I clicked again it did. I’m a brand new beginner and this tool will be SUCH a GREAT help! Thanks so much! Do you know if this will work with Microsoft Powerpoint 2008 for Mac ? @ MVP Shyam Pillai …. Thank you very much for the Add-In! What a great user community. Great tool. Doesn’t seem to correct the problem of object orientation though. If I use a circular path, the car would always be right-side up rather than going upside down at the bottom of the circle. Any suggestions? I used motion paths in PowerPoint for a recent roll out of smart metering here in Australia. We had existing network maps (large images files) but it was difficult to follow the flow from the base (people’s homes) back to to the grid. I created a coloured ball showing the power ‘pulsing’ that I put on top of the image map and then carefully mapped the path for it to flow. It went from the home to the collector (network) then through the various network components and finally back to the grid. The trainers liked it and simply have to click the various animation points to watch the ball go – it was nice and visual which made it easy for the participants to process a complicated (and cluttered) network map which they’ve had to process in the past. That’s my experience as well. I posted a screenr on this tool back in May (http://screenr.com/5pp) and I didn’t include examples of circular motion plans nor combined effects such as a motion path plus a grow/shrink effect because the tool can correctly identify the end position of the object but not the post-animation size or orientation of it. Despite those limitations, I have found the tool quite useful. @Stephanie: cool…didn’t realize you had already shown the add-in. When I was WaMu I used it quite a bit. It makes stretching animations over lots of slides very easy. @Stephanie: Supporting all animation end states is something that I will support sometime in the future when I can devote time to it. Thanks for posting the video. Every time I create a new Powerpoint in which I want to use this animation tool, must I install it into each Powerpoint file or does it install into my Powerpoint application for repeated use? Yeah, I agree that the tool is valuable and I use it quite often in most of my projects. Perhaps this is a tool, enhanced, that could be listed on James Kingsley’s site for free or for a small fee. It’s utilities like this that make life so much easier for all of us. Awesome article(as always!) Tom and great job with the tool Shyam! @NJK: good question. Perhaps Shyam can answer. I found that when I moved the location of the add-in, it disappeared. So I’m not sure how it’s supposed to work as far as remaining or if when it doesn’t it’s a bug. oh: and anyway, thanks a ton for the good work here!! I, like Geoff, have ppt 2003. Does anyone know if this works in 2003 before I download it? @NJK: How are you loading the add-in? Are you double-clicking it or have you set it up to load from the add-ins dialog? @Klaus & Rachel: the product works in PowerPoint 2003. As far as downloading, I just think that the blog readership created a log jam the first few days and my guess is that it’s back to normal. Hi Tom! When I use animations with spins, circles or curves they don´t work on my courses after publishing it. have any idea why it happens? Hi Fernanda! Spins, circles and curves are supported animations (http://www.articulate.com/support/presenter09/?p=400) so they should work for you. Can you post your question and/or PowerPoint file to the forums (http://www.articulate.com/forums/) so we can help troubleshoot this with you? Muy interesante los temas de Power Point. Lo voy a mandar a Gladys de Marsans. I was wondering, what is the best way to perform an animation and advance to the next slide? 5. Automatically flip to the detail slide with a new set of bullet points. Currently I have to click at step 2 and at step 5 so it isn’t seamless. Just curious to find out if that’s possible. BTW – The tool made it SO much easier lining up the next slide, it took me 20 minutes to do it by hand. Wanna check that out to see if it helps? 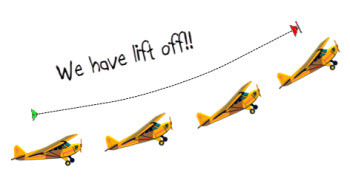 If you’re looking to do something different, just let us know and we’ll work it out with you.